Not all features of CITM are available on iPhones/iPads. For now Coach in the Mirror is free! 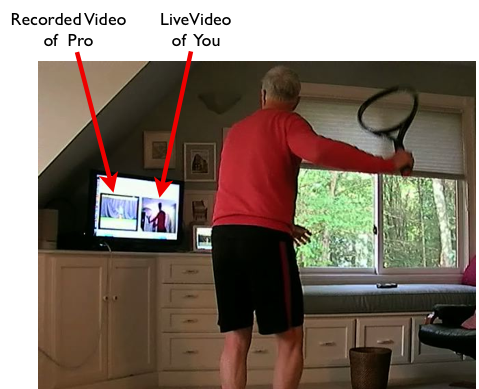 Practice your tennis strokes indoors anytime using the built-in camera from your computer. No ball or good weather required. Watch yourself shadow swing to video clips of tennis pros. Record these sessions for later viewing with your own coach. See you own body in motion, even from the rear, at the same time you are guided by the tennis coach video. Learn in a more holistic way by feeling the form and rhythm first before hitting the ball. And feel the aerobics of swinging continuously to the video loops. If you are a tennis coach, send your students "homework" by adding comments and tips to video playlists of your design. To send our video clips with your comments to friends or tennis students, sign in (upper right) and register your account. To customize your CitM experience and view CitM on a flat screen TV , download this file or go to our Help page.